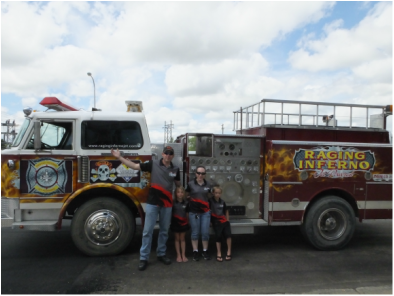 Hello my name is Travis Dockter and I am the driver of the American LaFrance Westinghouse J34 powered Raging Inferno jet fire truck. My story starts in the early 1990's when I got into stock car racing. I drove hobby stock dirt cars for a few years. I mainly raced at the Tri-County speedway in Wishek ND where i earned not 1, not 2 but 3 consecutive hard luck awards 1993, 1994, 1995. This is when I learned the importance of doing things right. But i had to finish high school, and of course i had to go get some kind of education after high school. Off to Wyoming Technical Institute for collision, refinishing, and custom paint. After returning home I just could not sit around and watch other people racing and having fun so back to racing again! But this time with a bit more power. I got into racing Wissota Modified's In 1996. 500 plus horsepower running on methanol was some of the most fun times iv'e had. Modified racing was good to me I earned the 1997 Rookie of the year award at the Bismarck Raceway. 1998 Sportsman of the year award and Bismarck Raceway, and the same year the IMCA modified Rookie of the year at Dakota Speedway in Mandan ND. 1999 brought another Sportsman of the year award at Bismarck Raceway. To me the sportsman of the year was the highest honor I could get in the racing world. In 2003 I earned my Private Pilots license and now I am able to enjoy another of my favorite pastimes flying. Being behind the wheel of a fire truck is nothing new to me, I am also an active volunteer firefighter with the Linton Fire Dept since 2004. I am also a Nationally Registered Paramedic currently working with the Emmons County ALS Ambulance, since 2007. I also work with my Dad at Dockter's Welding in Linton where I have been welding, machining , fixing broken things , and coming up with new adventures since I have been 5 years old. Thanks Mom and Dad!! I hold a Class A Commercial Drivers License with Passenger, School Bus, Tanker, and Double/Triple endorsements, and must met the federal requirements with D.O.T. physicals, and mandatory random drug testing program. I have a family with two kids, and mom and the kids say they look forward to putting on some great shows, and having a good time. I too am looking forward to putting on some great shows, and putting some smiles on a few faces along the way.